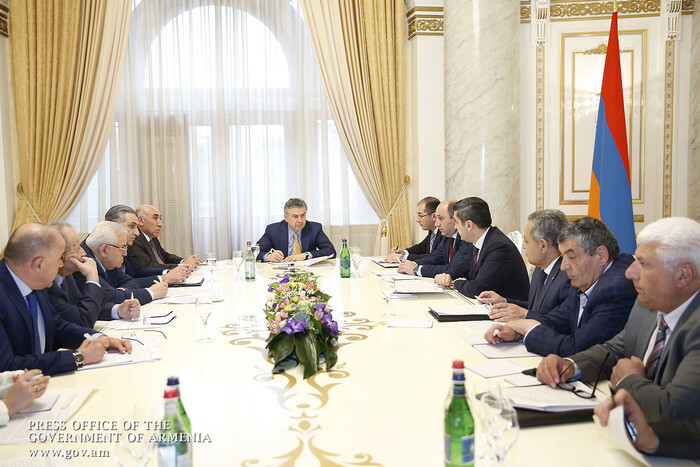 Chaired by Acting Prime Minister Karen Karapetyan, a consultation was held in the Office of Government to discuss issues related to the launch of the irrigation season and the implementation of medium and small water reservoir construction projects. Referring to the amount of water available in water reservoirs, Chairman of State Water Management Committee Arsen Harutyunyan reported that at this point of time, there is 480.5 million cubic meters water in the reservoirs, which is 30 million cubic meters less than in the same period in 2017, and 115 million cubic meters less than in 2016. The level of Lake Sevan is 1900 meters 56 centimeters, as much as in 2017. Water release through Arpa-Sevan tunnel has resumed since March 22. According to Arsen Harutyunyan, the main problem in terms of water supply is associated with the farmland supplied by the Akhuryan reservoir. Currently the Akhuryan reservoir has 336 million cubic meters of water, which is 36 million cubic meters less than in the same period of 2017. However, the Committee Chairman reported that 20 mobile pumping stations have already been set up and, at the same time, deep well drilling efforts are underway in different regions of Armenia. Arsen Harutyunyan advised that he had held several meetings with private investors interested in the construction of small and medium reservoirs in our country. He noted that the Committee had discussed with Hayjrnakhagits Institute CJSC the possibility of implementing over 30 small and medium reservoir projects, of which 11 reservoirs subject to priority construction, based on preliminary assessment of feasibility studies. It was noted that reservoirs have so far been built mediating borrowed funds (Marmarik, Vedi, and Kaps, Selav Mastara, which are under study), but based on the public-private sector partnership policy, the Committee has identified small and medium reservoir projects that could be implemented in cooperation with the private sector. The aggregate capacity of the aforementioned priority 11 reservoirs is 43.2 million cubic meters; the amount of investment - 34.2 billion drams. The reservoirs will be able to supply 17,000 hectares of farmland. Prioritizing the implementation of small and medium reservoir construction projects in cooperation with the private sector, Karen Karapetyan instructed the State Water Management Committee to finalize the programs and feasibility studies within a short period of time in cooperation with the Center for Strategic Initiatives. “We need to develop a strategy of providing agriculture with irrigation water. In addition, we must address the problem through public-private sector partnership,” the Acting Prime Minister said, stressing that as early as by this October, the State Water Management Committee should have a water supply program for 2019, based on enhanced discipline in the field of water supply.